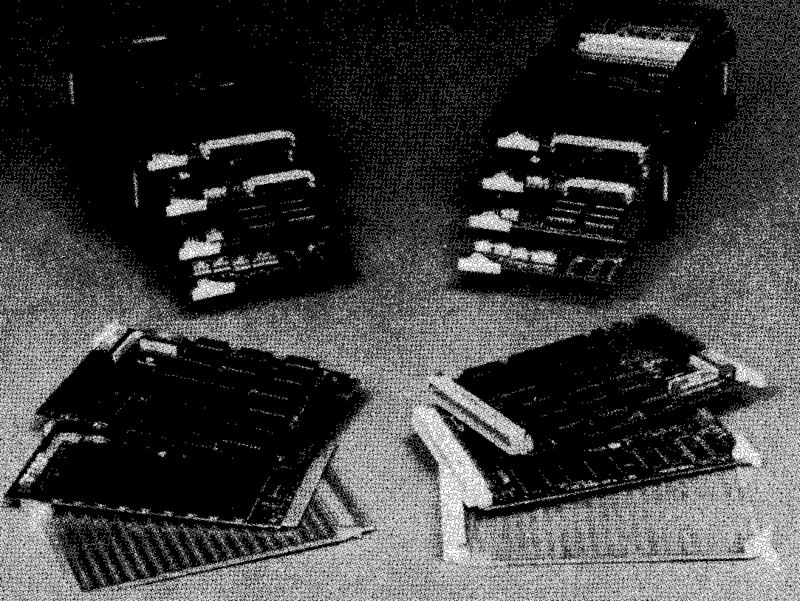 Microflex 65 is the name given to the range of Eurocard modules made by Rockwell to be both an extension to the AIM 65 and a stand alone modular Eurocard rack mounted computer. The 64-line bus offers memory addressing up to 128K bytes, and allows any card in any slot. A range of cages (4, 8 and 16 way) permit a variety of packaging configurations. 65 allows programs developed on AIM 65 to be installed on this SBC. Carries 8K bytes RAM in 2114 devices in two 4K blocks. allowing the CPU to select from 128K bytes. and assigned to one of two 64K banks. The entire module can be write tested by a switch. Refreshing is automatic and transparent to the CPU. Eight 24 pin sockets each allowing a RAM or ROM of up to 8K bytes. Switches allow independent setting of the start addresses of 4K memory blocks. Choice of 2, 4 or 8K byte memory device is by jumper. Controls up to four 8" or 5.25" drives, single or double sided soft sectored. Single or double density nay be selected under software control. Price includes ROM firmware for Disk, File and Directory functions. Monochrome output to monitor or TV (via on board RF modulator). provided on channel 1; RS232C on channel 2. Uses 6551 ACIA device. Cages have integral card guides. Allows extension to AIM 65 through a buffer module (code 180). May be mounted in a variety of orientations. Accepts axial module cooling fan. Screw terminals provided for power connection. connector, and the other onto the Microflex module to be used. pattern, with holes for wire-wrapping prototype circuits. the standard unit is limited to 16 inches.